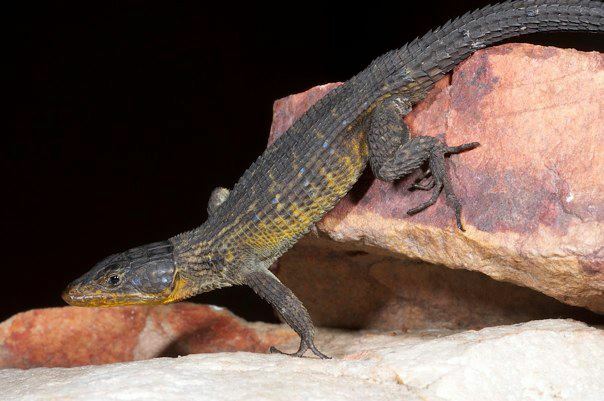 ​The girdled lizards (Cordylidae) are a family of distinctively armored scinciform lizards endemic to Sub-Saharan Africa. Most of the 81 named taxa are highly adapted for a rock-dwelling lifestyle, though the family encompasses a wide variety of morphologies, life histories and behaviors. In 2011 my coauthors and I proposed a new taxonomic arrangement for the Cordylidae, splitting the family into two subfamilies and nine genera, retaining all the for original genera (Cordylus, Pseudocordylus, Platysaurus and Chamaesaura), raising one genus, Hemicordylus from synonymy and creating five new genera: Smaug, Ninurta, Ouroborus, Karusasaurus and Namazonurus. This new arrangement retains Chamaesaura separate to Cordylus, which was a bone of contention for many who did not adopt the previous arrangement. 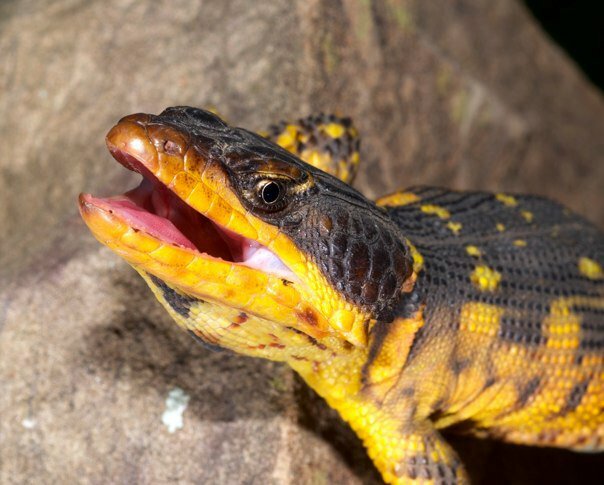 This page provides a little information about the content and characters of the ten cordylid genera. The highly flattened members of Platysaurus are swift, lightly-armored rock specialists. Their extreme flat morphology allows them to occupy the narrowest of cracks and they are often found under exfoliated flakes of granite, gneiss and sandstone. They are sociable animals, forming dense colonies, with males maintaining territories during the breeding season. Platysaurus display extreme sexual dichromatism; the males are spectacularly colored, while females and juveniles are drab by comparison. During territorial disputes, males expose their brightly colored bellies by tilting sideways, or raise the head and body on straightened forelimbs, revealing the bright coloration of the throat and chest. The dorsal surface is covered with granular scales, and osteoderms are restricted to the large scales on the head, legs and the lightly armored tail. Platysaurus are the only oviparous members of the Cordylidae. They nest communally in deep cracks, producing one or two large, elongated, soft-shelled eggs each year. Due to their adaptation to a rupicolous lifestyle they are limited to specific habitats and are thought to be poor dispersers. The genus has a disjunct distribution, with 24 Platysaurus taxa occurring in the Mpumalanga, Limpopo and KwaZulu Natal provinces of South Africa, Swaziland, Zimbabwe, Malawi, Tanzania and Mozambique and three species occupying a much smaller range along the border of South Africa and Namibia. It is hypothesized that the Southwestern forms are a relict population that was separated from the Northeastern species by the spread of the Kalahari Desert or by the changing course of the Orange River. An upcoming phylogenetic study that has comprehensive taxon sampling will revise the taxonomy further, naming several new species (Martin Whiting, Mitzy Pepper and Scott Keough in prep). Common names: Ouvolk, Sungazers, giant girdled lizards, dragon lizards. The genus Smaug contains the largest species of the cordylidae. All members of this group are robustly built and well armored, possessing distinctively enlarged occipital spines and sharply keeled caudal scales. The largest of all cordylids, Smaug giganteus, are commonly known as “Sungazers”, because of their distinctive habit of basking with their head pointed skywards. Unusually for cordylids, Smaug giganteus lives in deep, self-excavated burrows, which it retreats into when threatened. The other members of the genus prefer deep, horizontal crevices in shaded rock outcrops. The genus was named after the antagonistic dragon from J. R. R. Tolkein’s The Hobbit. According to Tolkien, (who was born in the Free State where these animals occur) the name Smaug is "the past tense of the primitive Germanic verb smeugan, meaning "to squeeze through a hole", making it a doubly appropriate name for dragon-like lizards that live in burrows or rock cracks. Because of their preference for rocky habitat, most members of the genus are not considered to be in any danger from habitat destruction. However, range fragmentation as a result of increased arable farming, collection for the pet trade and muti (traditional african medicine) is having a significant impact on Smaug giganteus populations. To find out more about these amazing animals, please visit the Sungazer Working Group's website, or check out my recent paper on the phylogenetic relationships of the S.warreni group. Ninurta coeruleopunctatus is a small, gracile lizard that occurs in the overlap of the summer and winter rainfall zone on the southern coast of South Africa. They are strikingly colored, with breeding males displaying orange or lime green throats. The eastern populations of this species are covered in beautiful enamel blue spots, which gives them their specific and common names. Our molecular analysis returns Ninurta as sister to Chamaesaura, a novel and unexpected result. The genus is named for the Akkadian god of the south winds and rain, referencing the sole species’ occurrence along the cool, moist south coast of South Africa. This small group of highly modified lizards is undoubtedly the most atypical of the cordylid genera. Substantial reduction of the limbs, pectoral and pelvic girdles, and a greatly elongated tail, gives them a serpentine appearance and allows them to efficiently “swim” through foliage. 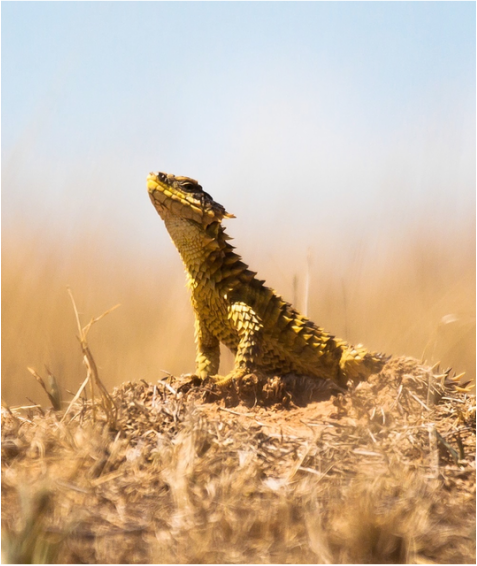 The name Chamaesaura, which means “creeping lizard”, is something of a misnomer, as these grassland specialists move with great speed and are capable of outpacing bushfires. Like all cordylines, Chamaesaura are viviparous, and are the most fecund members of the family, producing up to 17 offspring at a time. This reproductive strategy is thought to be an adaptation to life in fire-prone habitats (du Toit et al., 2003). They are capable of autotomising their tail, but do this less readily than other members of the family, as this greatly impedes their locomotive ability. Despite being limited to grasslands, Chamaesaurahave a broad geographic range, with three species occurring in Southern Africa and widely separated subspecies (though these are most certainly valid species) occurring in the grasslands of Zambia, the Democratic republic of Congo, Uganda, Kenya, Tanzania and Angola. 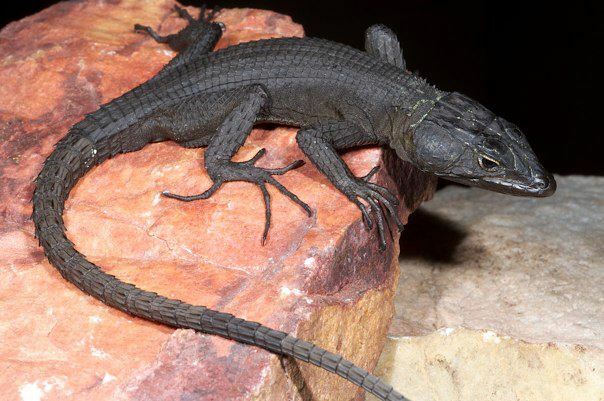 The genus Pseudocordylus contains at least six species of robustly built, lightly armored lizards that occur from the northern Drakensberg to the Cape Fold Mountains. Three of the species overlap in the northeast edge of Lesotho, although it appears that the various ranges are divided attitudinally, with P. spinosus occurring at lower altitudes, P. subviridis in the middle areas and P. langi restricted to the highest peaks (above 3000m). Like the flat lizards, Pseudocordylus display extreme sexual dichromatism, with males being more brightly colored than females, although ritualized courtship and aggregation behavior of Platysaurus has not been recorded.The reduced dermal armor, sexual dichromatism and specialization for crevice dwelling lead to the proposal that crag lizards and flat lizards are closely related. However, molecular analysis shows that these characters are simply broadly convergent. 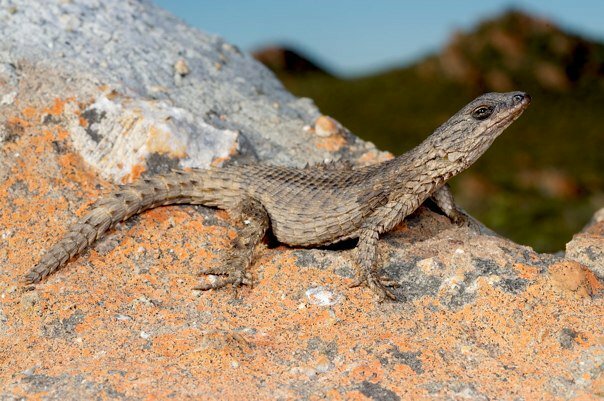 Preliminary studies suggest that there may be a good degree of gene flow across Pseudocordylus populations in the Cape Fold mountains, while the Drakensberg crag lizards may contain several undescribed species. Much more work is needed to untangle the complex but fascinating relationships of this group. Distribution: The winter rainfall zone of the Western and Northern Cape. Ouroborus is a monotypic genus that is restricted to the semi-arid winter rainfall region of South Africa. One of the most extraordinary lizards of the family, Ouroborus cataphractus is heavily armored and displays unusual defensive behavior; when caught in the open, these lizards will curl up and grasp their tails in their mouths, protecting their poorly armored underside. 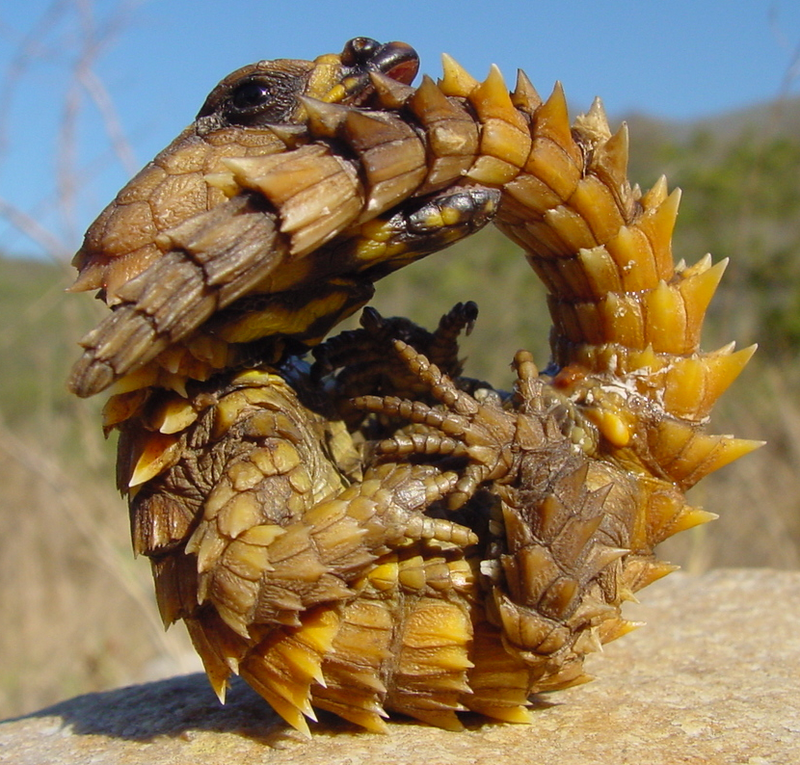 This behavior gives them their common name, armadillo lizards, as well as their generic name, which is derived from the greek for “Tail-eater” and refers to an ancient symbol depicting a serpent or dragon biting or swallowing its own tail to form a circle. Ouroborous cataphractus are uncommonly social cordylids, forming dense aggregations of up to 60 individuals. Namazonurus contains five species, all well-armored and restricted to the western semi-arid regions of South Africa and Namibia. They possess enlarged, tubular supranasals and females lack femoral pores, perhaps a result of life in an arid environment. One species, N.peersi, is melanistic and loosely colonial. 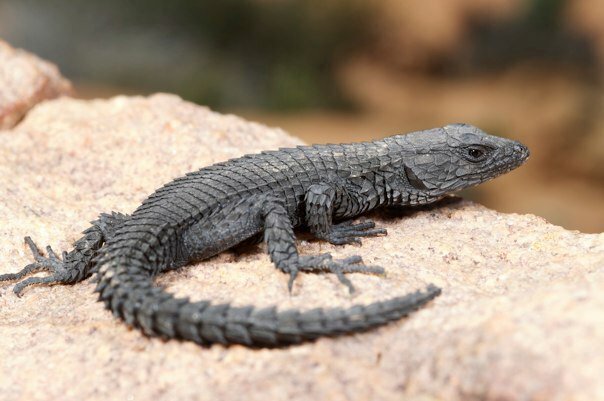 Common names: Karusa lizards, Karoo girdled lizards. The genus Karusasaurus comprises two small-scaled species, widely distributed throughout the semi-arid areas of South Africa and southern Namibia. There is an incredible amount of variation in color of K. polyzonus; populations can be jet-black, brick red, turquoise or speckled, depending on locality. Habitat: Large boulders, Cliffs and vertical rock faces along gorges. Range: The Cape Fold Mountains. 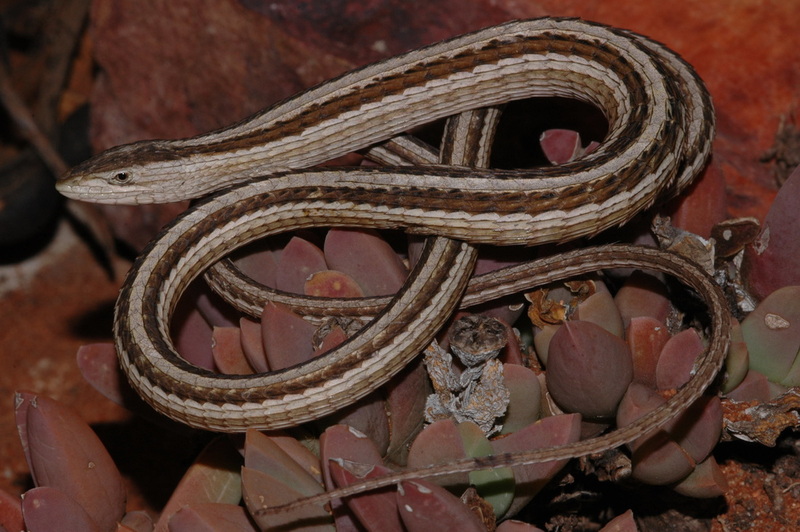 The genus Hemicordylus is endemic to the Cape Fold Mountains and currently contains two named taxa: Hemicordylus capensis and H.nebulosus. While the dwarf species H.nebusosus is known only from it’s type locality on Landdroskop peak in the Hottentot’s Holland mountains, H.capensis occurs across the length of the Cape Fold Mountains, encompassing several smaller mountain ranges, from the Bokkeveld mountains in the North, to the Kougaberg in the East. The armor of H. capensis is highly variable across its distribution, and may be correlated with thermoregulatory behavior. Both members of the genus are melanistic and studies suggest they utilize the vertical surfaces to help regulate their temperature. Habitat: Small rocks, dead trees, euphorbia bushes. Members of the genus Cordylus are small but relatively robust and well-armored lizards, possessing distinctive, spiny tails and large, keeled dorsal scales. The genus is now divided into two major clades: one group is entirely endemic to South Africa, the second group occurs from Swaziland as far north as Angola and Ethiopia. While the Southern clade contains some of the most common and well-studied lizards in Southern Africa, the northern forms have received little attention until recently, resulting in the recognition of several new species from Angola, Tanzania, Mozambique, Malawi and the Democratic Republic of Congo.